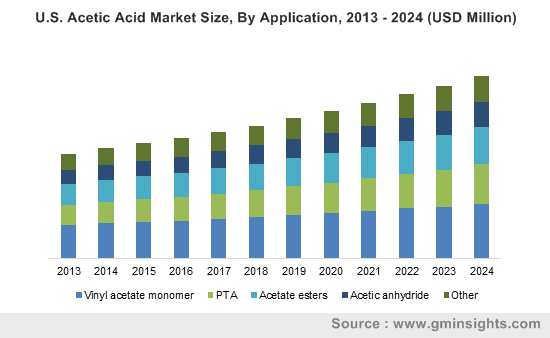 Acetic Acid Market « Global Market Insights, Inc.
A strong vertical of polymers & advanced materials business space, vinyl acetate monomer market stands to gain much over the ensuing years on virtue of its extensive end-use spectrum. This clear colorless liquid rather acts as chemical building block in resins and polymers manufacturing. With resins, polyvinyl acetate in particular, being abundantly utilized across a plethora of mainstream sectors for its bonding properties, the meteoric rise of vinyl acetate monomer market is sure to continue. 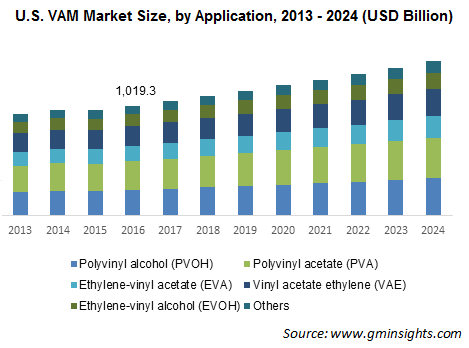 In fact, estimates depict, overall business share from polyvinyl acetate applications is forecast to record USD 2.5 million by 2024. Armed with an intent to call their bets in the profitable landscape, a bulk of vinyl acetate monomer industry players therefore have been tending to hike the price of acetyl intermediates. Quoting a recent case, Celanese Corporation CE, the Fortune 500 nominated specialty materials manufacturer has recently made to the front page with its update on acetyl intermediates’ price increase. As per reliable reports, the U.S. based vinyl acetate monomer market giant increased the price of VAM and acetic acid by almost USD 150/MT in Turkey, MEA, South America and Mexico, effective from April 1st, this year. While in U.S., and Canada the price is set to witness a hike by 5 cents per lb., in Europe, it has increased by €100/MT, cite sources. Celanese’s appropriate pricing actions also come as a response to the volatile raw material price trends of vinyl acetate monomer industry. Additionally, it also depicts the company’s scrupulous effort toward reducing the overall operational cost via strategic pricing initiatives and productivity actions. Speaking of the strategic landscape, some of the big shots present in the business space are also trying to expand their product capacity in a bid to win a competitive advantage. Say for instance, INEOS Oxide, one of the globally acclaimed vinyl acetate monomer market players has recently announced its plan of developing a new VAM project in Europe. Through the company is still in phase of looking for the preferred location of the project, sources familiar to the matter stated that INEOS’s Antwerp and Hull sites hold a greater chance. This is probably due to the fact that both these aforementioned regions are privileged with well positioning and ample feedstock supplies that would prove to be beneficial for Europe vinyl acetate monomer market share. Citing another similar kind of instance across the Asian turf, leading chemical giant Wacker Chemie AG toward the end of last year, further expanded its vinyl acetate production facilities in China. The Munich-headquartered firm, reportedly also aims to open new factories in South Korea to meet the increasing demand for the product globally. With robust industrialization across China and India, and favorable government compliance to bring FDI for construction domain, APAC vinyl acetate monomer market trends is likely to witness a plethora of opportunities over the ensuing years. As per estimates, APAC market is slated to carve a y-o-y growth of 5.2% over 2017-2024. It is imperative to mention that one of the pivotal factors that has proved to be deterring for the industry growth is the product related health jeopardy. It has been observed that inhalation of VAM often leads to serious health issues like respiratory tract irritation, eye irritation etc. In a bid to respond to these heath challenges, a number of renowned regulatory bodies such as EPA, OSHA, and FDA, are mandating stringent environmental norms with regards to its deployment. While the strict regulatory groundwork may seem to have been accepted as a consistent practice in the changing phase of vinyl acetate monomer market, volatile raw materials price trend is another factor imposing restrictions to its bulk production. Despite these restraining factors, vinyl acetate monomer market is slated to emerge as one of the lucrative verticals in the chemical space, aptly influenced by its widespread application spectrum. In terms of commercialization, global vinyl acetate monomer industry size is forecast to exceed USD 10 million by 2024. This entry was posted in Polymers and Advanced Materials and tagged Acetic Acid Market, Polyvinyl Alcohol Market, VAM Market, VAM Market share, Vinyl Acetate Monomer (VAM) Market, Vinyl Acetate Monomer Industry, Vinyl Acetate Monomer Industry Analysis, Vinyl Acetate Monomer Market, Vinyl Acetate Monomer Market forecast, Vinyl Acetate Monomer Market growth, Vinyl Acetate Monomer Market outlook, Vinyl Acetate Monomer Market pdf, Vinyl Acetate Monomer Market share, Vinyl Acetate Monomer Market size, Vinyl Acetate Monomer Market trends.